War is not for children nor for adults. But it’s a world where you can learn who you want to become. It’s a harsh way to go through the lessons of life and decide whether you want to change in a better or a worse way. Baraka tells the story of two brothers whose path were different, a story of two friends who were unlike each other. But through that difference one soul will gain an important knowledge that will help to guide through as a shining light. Umayr and his best friend are playing a way, but in their own way. One day in an abandoned and mostly ruined building, they find a Spanish soldier, Laura, who was abducted by terrorist forces and is due to be executed. Two Arab friends have to decide what to do with Laura: to free her or finish what had been finished by, they believe, their own army. However, that is the precise moment when the friends’ loyalty will be tested, as well as their perspective of war and the meaning of enemy. 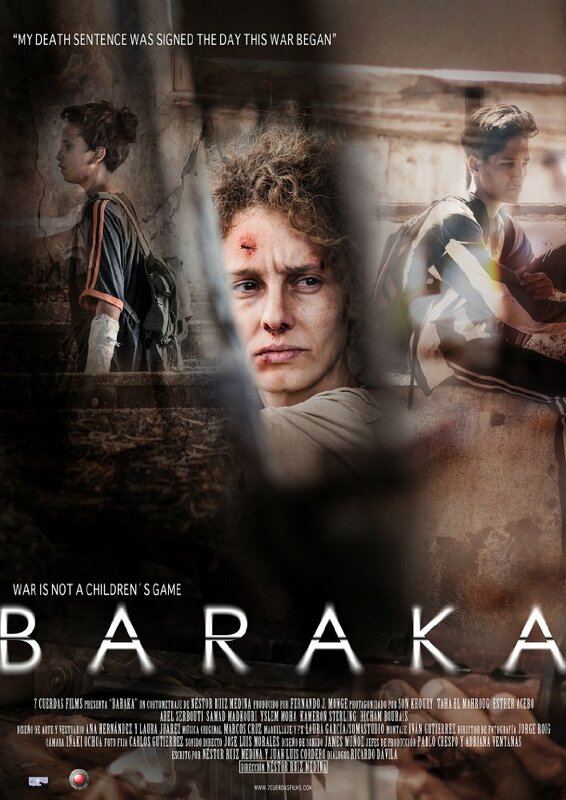 Having such a great concept, Baraka touches upon a painful subject matter I am sure many have to face on a daily basis if those people are in a war zone. While there is shown a disagreement of Umayr and the way he assumes an enemy should be treated, he keeps thinking of his own brother, a necklace that he gave him, and a hope that no matter what will happen during the war, the brothers will always remain same as they used to be before the war began. The film is shot in Arabic, perfectly delivers a difficult environment from the child’s point of view. The story that unfolds quickly leaves no gaps or the moment that as soon as the child holds the gun in his hand, his personality changes significantly. Umayr is described as a very intelligent boy who can distinguish between the good and the bad; between why killing is not good and how the murder of an enemy may not bring a resolution. In the end, Baraka is a surprisingly excellent short film that could have been even better if the director Néstor Ruiz Medina would ever agree to make it as a feature film. With so many things that could have been told in this film, the viewer will be left wanting to see more, and he will be right. But not because it misses something or leaves certain things untold. It’s just so good that anyone who believes in storytelling deserves to have an extended version of Baraka. Until then, lets just enjoy the short version of it, which is as good as it could get.